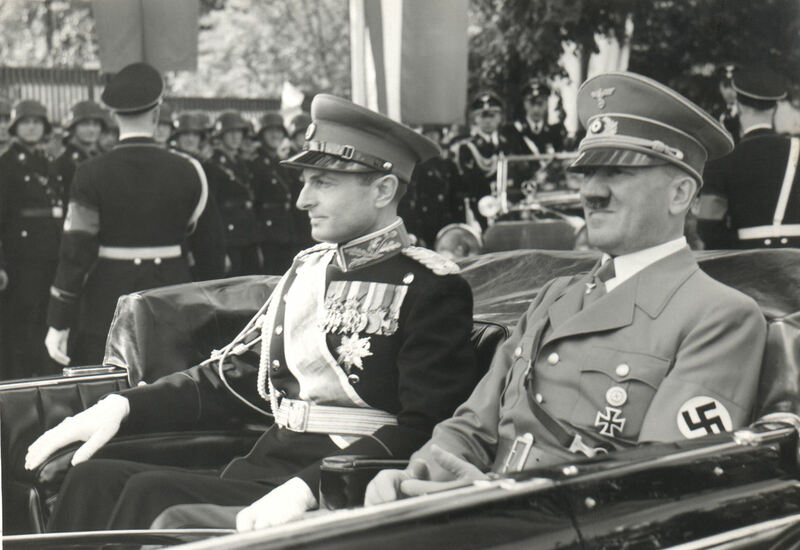 PHOTO: Photo of Adolf Hitler and Serbian Prince Paul of Yugoslavia (Knez Pavle Karadjordjevic). The Serbian Ministry of Information, in conjuction with a nationalist ‘researcher’ Dr. Milan Bulajic [Srebrenica genocide denier] and the Serbian Orthodox Church, took a leading role in propagating the myth of Jasenovac. For a vast majority of Serbs, maintaining a grossly exaggerated number of ‘700,000′ Jasenovac deaths was absolutely central to their national self-identity. A high number ‘proved’ that Serbs were one of the ‘primary victims’ of the World War II, rather than Nazi collaborators (Chetniks) responsible for genocide over the Bosnian Muslim (Bosniak) and Jewish population in the Second World War. The largest part of Milan Bulajic’s book, “Jasenovac”, intends to respond, by using Greater Serbian hegemonist argumentation, to Franjo Tudjman’s book “Wastelands of Historical Reality: Discussions on History and Philosophy of Aggression and violence.” It is obvious that Bulajic is not competent to debate with Tudjman’s book, primarily because of the fact that he is lacking abilities and knowledge to do so. This is why Bulajic deals primarily with the question of the number of victims, especially at the camp at Jasenovac. In true Greater Serbian fashion, he uses untruths in the largest possible number, and attributes comments to Dr. Tudjman which were never made in Dr. Tudjman’s book. 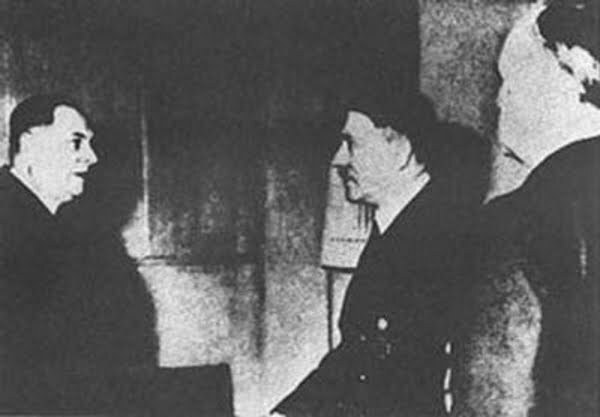 PHOTO: Meeting between Serbian Chetnik Milan Nedic, the president of a Nazi-backed puppet government in Serbia, and Adolf Hitler, on 19 September 1943. A textbook example of Greater Serbian use of lies is Bulajic’s claim that Dr. Tudjman “argued that the figure of 5.1 million Jewish victims is incorrect, that it is `only’ about 900,000,” even if it is easy to show that Dr. Tudjman cites Raul Hilberg (p. 156 of Tudjman’s book) who “says that of 5.1 million victims only 900,000 can be documented,” and the same author says that “the figure of six million is considered by some as a gross exaggeration, and that the figure of one million is the most impartial amount.” The rest of Bulajic’s interpretations are based on tendentious speculations, as well as the one example mentioned above. This is also the case with Bulajic’s interpretation of the number of victims of the war in Yugoslavia, and related to that, the number of victims at Jasenovac. This is why we have to provide the basic data related to these statistics. In 1947, Vladeta Vuckovic, then a second year student of mathematics employed at the demographic division of the Federal Statistics Office of Yugoslavia, received instructions from the director of the office, Dolf Vogelnik, and his assistant Alojz Debevec, to calculate the number of victims of the Second World War. They assigned this task to a novice because a comprehensive census had not been taken, something that is essential for making this kind of calculation. In this way Vuckovic arrived at the figure of 1.7 million demographic losses. In the meantime, hoping to increase its allotment of German reparations payments, and hoping to augment its contribution to the Allied victory, Yugoslavia presented the figure of 1.706 million victims to the peace conference at Paris by its Minister of foreign affairs Eduard Kardelj. In 1948, when a national census was made, Vogelnik had to justify the figure which Kardelj had presented to the Paris conference, so in the Statistical Review 1/1952, he published an article wherein he claimed that the demographic losses sustained by Yugoslavia were most probably 3.25 million, or, at the very least, 2.9 million. Ivo Lah replied to this “scholarly” article in the following issue of the Statistical Review 2/1952, where he argued that according to Vogelnik’s calculations the average annual growth rate between 1941 and 1948 was at 2.13%, or, at the very least, 1.86%, a level it had never reached. Namely, during the period 1921-1931, Yugoslavia’s annual growth rate was 1.5%, and after 1931 it dropped off continually, falling to 1.1.% by 1939. Two years after Vogelnik made his estimates, the American Bureau for Population Losses calculated that the number of victims in Yugoslavia was 1.067 million (P. Mayers and A. Campbell). After this, it was clear to Yugoslav authorities that the size of the request for reparations payments from Germany presented at Paris could not be substantiated. Thus, by 1963, the Yugoslav government had revised its claim to the German government, reducing the number of victims to 950,000, down from its original claim of 1.705 million. It is easy to verify that 597,223 is 59% of the 950,000 already presented to the German government, and about 56% of the amount calculated by Mayers and Campbell. The census gave the figure of 49,874 as the number of victims of the Jasenovac camp. The evidence was hidden from the public. Of course, since Dr. Bulajic was employed with the Yugoslav Ministry of Foreign Affairs, he probably knew about all of this, unlike other researchers. The problem inside the country was solved in such a way that none of this would have been known had it not been for Bulajic’s book. The very fact that he covered up the figure of 950,000, which was presented to Germany, reveal its importance. By the end of Tito’s life, the Greater Serbian project began to gain force in Serbia. It thus became clear why the claim that the Chetniks had been accepted int the ranks of the communists, even if the Serbian communists were not far removed from Greater Serbian designs. Jasenovac and the number of its victims had an important part to play in this project, and so it is not only natural that someone who knew something no one else knew played a main role in this – Dr. Bulajic – a person who worked in the Yugoslav Federal Secretariat for Foreign Affairs. Since the realization of the Greater Serbian project required the consensus of the most important Serbian groups (the communists, the army, and the Serbian Orthodox Church), it is logical that when it had to do with the camp of Jasenovac, in trying to prove the genocidal capacity of the Croatian people, with the aim of inciting the Serbs of Croatia to revolt, one had to resort to the politics of the Second World War. Just as in the Second World War, this had to be an important step forward, to which we are witnesses even today. How did things look during the Second World War? The camps existed in Serbia as well, where from the end of 1941 to the end of the war there was no revolt among the populace. There had to be more camps in Croatia, where there was constant resistance to NDH (The Independent State of Croatia), and especially due to the brutal attacks against Croatians by the incursions of chetniks of pop (=priest) Djujic, which evoked a response in kind. This is why the letter of the former Yugoslav royal diplomat Dr. Prvislav Grisogono to the Archbishop of Zagreb Alojzijus Stepinac was forged, in which the horrible crimes of the period of NDH are mentioned. These crimes are described, but these descriptions correspond with the crimes committed by Serbian chetniks in all the wars of this century, probably even earlier, since they are a part of the Serbian national epic. This letter was widely distributed among the Serbs of Croatia, with obvious intentions, and abroad as well. Even Bulajic admits in his book that “the question of authorship is unimportant,” which is true – but the letter had already played out its propaganda part. But this kind of Serbian propaganda during the war was an exaggeration of the number of victims of the NDH. According to these sources, the number of victims by the end of 1941 was 382,000, more than 518,000 by the end of Feburary 1942, then 600,000 by October of 1942, 800,000 during 1943, and over one million by the end of the war. Similar data was used by the Serbian Orthodox Church. This was necessary to the Serbian Orthodox Church in order to divert attention from the fact that the highest circles within the Church and the Serbian intellectual elites collaborated with the Germans and themselves propagated Nazi politics and believed that it was possible to achieve Greater Serbian ambitions within the Hitler’s system. In his 1935 book, The Nationalism of Saint Sava, the bishop of Zica, Nikolaj Velimirovic, claimed that St. Sava was a precursor of Hitler. Other high-ranking officials of the Serbian Orthodox Church were not far behind Velimirovic in this respect. But the clergy of the Serbian Orthodox Church was not alone in cooperating with the Germans, the large majority of Serbs did as well. This is why on August 13, 1941, 545 prominent Serbs issued the “Appeal to the Serbian people,” which called upon Serbs to be loyal to the German occupiers and condemned the partisan movement as unpatriotic. The first three signatories on the appeal were bishops of the Serbian Orthdox Church. Later, 28 of the signatories became members of Serbian Academy of Sciences and Arts, whose role in the preparation of the 1991-1995 war is well known (see the Academy’s memorandum). The fact that the highest circles of the Catholic Church behaved differently presented a serious problem for the Serbian Orthodox Church. Archbishop Stepinac of Zagreb spoke out against Nazi and racist policies, he helped to save the lives of Jews, and was known as a “friend of the Jews.” This is why the communist’s false accusations against Stepinac as a war criminal help Greater Serbain propaganda, because it diverts attention from the dishonourable behaviour of the Serbian Orthodox Church. Dr. Bulajic attempts to assist in this respect. Thus in his book he makes accusations which are so absurd that they are unparalleled in historiography – Stepinac is accused of committing treason, because he (thinking of the good of his people and his people’s desire for freedom, accepted the creation of a Croat state) broke the “holy vow of faithfulness to His Majesty,” i.e. to the king Alexander of Yugoslavia. With the figure for the victims of the Second World War similar to those claimed by Greater Serbian propagandists during the course of the Second World War, Bulajic turns his attention to the preparations of the 1991-1995 war. Accordingly, the Serbian Orthodox Church presents the opinion that at Jasenovac “if not more, then certainly not less than 700,000″ people died, and Jasenovac is referred to as the second largest Serbian city “below ground.” In fact, the story of Jasenovac deflects attention from the Belgrade camps of Sajmiste and Banjica, better put, from the Belgrade camp. With reference to Sajmiste, it is important to note that it is the only concentration camp in the Second World War which was set up exclusively for Jews, the only “Jewish camp” (Judenlager) in the world, from which no Jews survived (this was true of Banjica as well). Camp inmates were executed on the streets of Belgrade, using mobile gas chambers, and mass graves were located in various parts of the city. This makes Belgrade the only capital city that was also a concentration camp during the war; and all of this in plain view of the city’s inhabitants. Referring to the number of 59%, which was the Yugoslav war victims figure submitted to the Germans, because an exact estimate of the number of victims was considered impossible, Dr. Bulajic, claiming the opposite, goes in the opposite direction trying to verify the numbers claimed by the Serbian Orthodox Church, knowing that the census taken in 1964 was accurate because the interest in the census was very great. The argument that a more thorough census will be possible at a later date is not logical, but we have seen that Dr. Bulajic is prepared to use all the methods of Greater Serbian propaganda – first and foremost – lies. Logic is certainly not his great side. Namely, if the figure of the 1964 census is accepted as including 59% of all victims, so that 950,000 is the exact number of victims of the Second World war on Yugoslavian territory, it must be accepted that according to the Serbian Orthodox Church, according to Bulajic, and according to Greater Serbian propaganda in general, about 74% of all deaths in the war occurred at Jasenovac. And if we use the number provided by the census of victims in 1964, it becomes apparent that at Jasenovac alone 100,000 more people were killed than in the whole territory of Yugoslavia, including Jasenovac. How can something like this be maintained by the members of a Church, which should act as a moral authority in its society? This is so absurd that the authorities themselves must be aware of it. In the meantime, they hide the fact that already in 1963, in Yugoslavia’s claim on reparations from Germany, Yugoslavia presented Germany with a figure of 950,000 victims. Greater Serbain politics used exactly this kind of false information in its mobilization of the Serbian populace for war and genocide in 1991-1995. Realizing that politics were going in this direction, a Serb, Dr. Bogoljub Kocovic, and a Croat, eng. Vladimir Zerjavic, independently of each other, began anew to calculate the losses incurred during the Second World War. The Serbian demographer calculated a figure of 1.014 million, and the Croatian 1.027 million. We notice that the number of victims counted in 1964 is 58.9% of Kocovic’s amount, that is to say, very close to the “infamous” 59%, “infamous” because it is odd to note that after the investigation of the number of victims one knows exactly the percentage of the census which was supposed to be known in the first place. Kocovic’s and Zerjavic’s result confirm the earlier figures which Yugoslavia presented to Germany, but which were not substantiated by the figure reached in 1964 census. Research which validates the work of Bulajic in the sixties, is unfavorable to Bulajic in the eighties and nineties. He therefore takes issue with Zerjavic’s (only) results, comparing the results for Bosnia and Herzegovina done by Zerjavic (316,000) and those by the Presidential Republican Conference of the Socialist League of Working People in 1989. How could the Presidential Conference have a more accurate number (taking away 177,045 collaborationist’s deaths) than the one reached in 1964 is not known, but this is why Bulajic then claims: “It is important to remember the amount of 453,877 does not represent final number of the deaths in the territory of Bosnia-Herzegovina.” Of course, he nominally “proves” the inaccuracy of the results attained in the census of 1964, citing the cases of the villages Veliko Nabrde, Ustice, Zemun, but he does not show where his more accurate information came from for this “local data.” But even then figures only prove the accuracy of Kocovic’s and Zerjavic’s calculations. Of course, he does not “see” this, but feels it is acceptable to simply say that their results are inaccurate and to continue to claim that Jasenovac claimed ’700,000′ victims, that is, a number that is more than 70% of the number which Yugoslavia presented to Germany in 1963. It is likewise unimportant to Bulajic that acceptance of this figure would mean that the Serbs experienced a much larger birth rate during the war than they had either immediately before or after it. Regardless of the fact that there was no war in Serbia from the end 1941 to the end of the war, it is hard (and sad), to make such a claim. It is important only to repeat the false number of 700,000 killed at Jasenovac, probably because the real number would reveal that more people were killed in Belgrade camps than at Jasenovac. The effects of this kind of politics brought catastrophic result in the war 1991-1995. Let’s just recount a few facts from the war in Croatia. Already in 1990, the Yugoslav National Army took Baranja, district Beli Manastir (with a (25.5% Serb population), in August 1991 Vukovar was attacked (37.4% Serb) and parts of the districts of Osijek and Vinkovci. Along with eleven occupied districts with majority Serb populations, the Serbs occupied the districts of Petrinja (44.6% Serb), Pakrac (46.4%), Podravska Slatina (35.8%) and a part of Nova Gradiska (21.8%), Slunj (29.8%), Drnis (21.3%), Otocac (32.2%) and Karlovac (26.2%). The city of Vukovar was completely destroyed and other cities settled not only by Croats. During the entire time Serbs shelled unoccupied territories, apartment complexes, factories, churches, schools, hospitals, and they even mined the dam at the Peruca hydroelectric plant. In occupied territories and in the areas nearby, 140,000 residences, 120 factories, 1023 sacred objects (churches, chapels, monasteries, and parish houses), about 50 schools, 20 hospitals, 60 railway and road bridges, electric and telephone lines were wholly or partly destroyed. In occupied territories, Croats lost all their possessions. In Croatia, about 180,000 people were forced to flee their homes. From Bosnia, about 200,000 Muslims and 160,000 Croats fled, from Vojvodina 45,000 Croats, from Serbia 15,000, from Kosovo 7,000, and from Montenegro 500. At one point, Croatia housed 600,000 refugees. Worst of all are the large number of dead and permanently injured, as well as the devastated families. These statistics did not include the war in Bosnia and Hercegovina. In the meantime, some still manipulate the data on the victims of the Second World War, particularly those at Jasenovac.